People have their legal name changed for many reasons. If you desire to change your name, you will save time and money by being prepared. Like any legal process, name changes require certain steps to be taken and certain criteria to be met. With a little knowledge and the right documentation, you can expedite the process of legally changing your name. 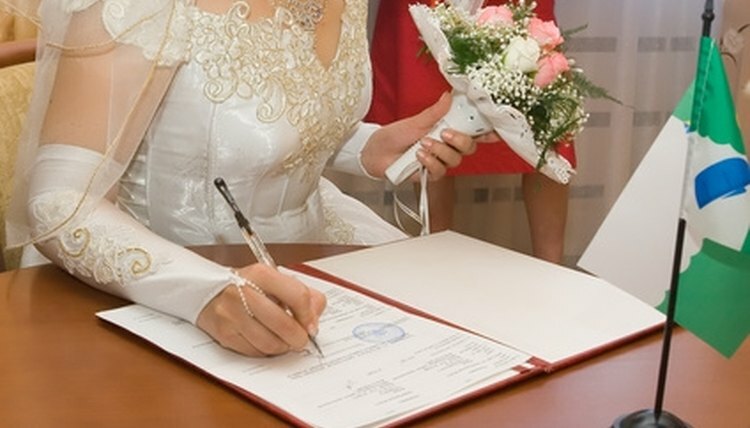 Whether due to marriage, divorce or the fact that you just don't like it, you can legally change your name with few exceptions. You cannot choose a new name with fraudulent intent. Your new name cannot be a racial slur, intentionally confusing or considered threatening or obscene. Lastly, you cannot interfere with the rights of others by changing your name, which generally means you cannot choose the name of a famous person with the intent to mislead. If you are only changing your last name due to marriage or divorce, the process is straight forward. Change your driver's license first at your local Department of Motor Vehicles. This will require your current driver's license, birth certificate and marriage certificate or divorce decree. If you are changing your last name due to divorce, make sure that you include in your divorce decree your desire to change your last name. Although not mandatory, it could make the process much smoother. After you change your driver's license, you will need to change your social security card. This can be done by mail or in person. You will need your new driver's license, birth certificate and marriage certificate or divorce decree to obtain your new social security card. If you choose to make the change by mail, be sure to make copies of all documents sent and expect to wait up to eight weeks for your new Social Security card to arrive. Once you have changed your driver's license and Social Security card, you can easily change any credit cards or professional licenses with your new documentation. The fastest and easiest way to change most of these is over the phone. If you are changing your name for other than marriage or divorce, you will likely need a court order. Court orders for name changes are not difficult to obtain, and kits are available that will walk you through the legal process. These kits cost around $200 and contain all the required documents that need to be filed, as well as instructions on how to file them. If you are changing your legal last name due to marriage, make sure you use your maiden name on all travel documents. This will help you avoid headaches you may encounter when traveling on your honeymoon. With new stricter airline safety guidelines, you will not be able to board a commercial airplane if the name on your boarding pass doesn't match the one on your passport or driver's license. Pickard, Brandon. "Fastest Way to Legally Change Your Name." , https://legalbeagle.com/6008818-fastest-way-legally-change-name.html. Accessed 21 April 2019.